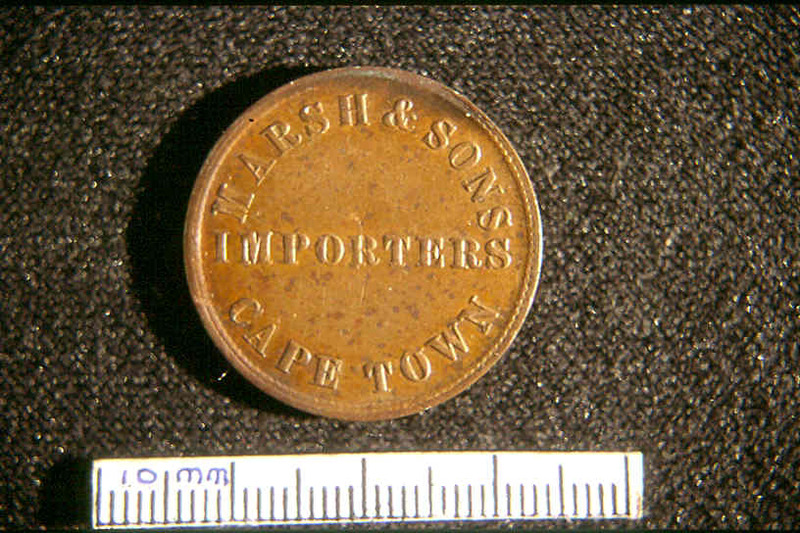 Nineteenth Century South African Tokens. Click on any of the small images to view a full sized image. 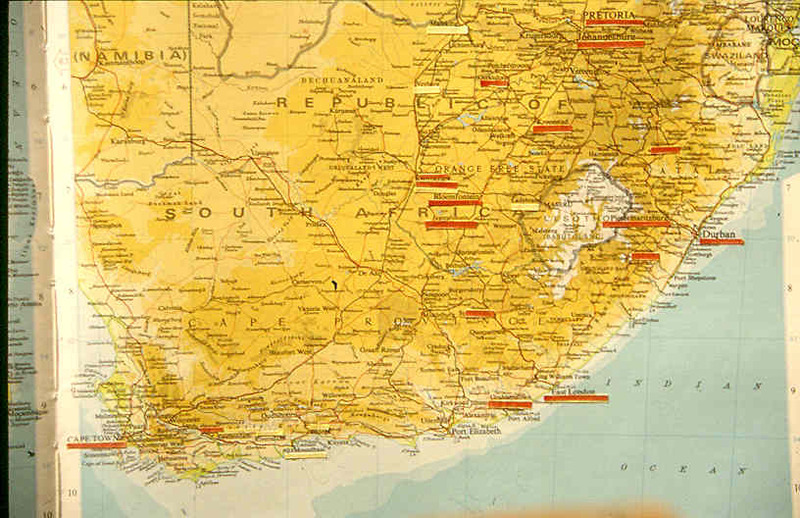 Map of 19th Century South Africa. This shows the area at about the time when the first tokens were issued. Selected issues followed chronologically through the second half of the Century illustrated aspects of the development of Southern Africa. Discovered by the Portuguese, settled mainly by the Dutch, it was captured by the British during the Napoleonic Wars. In 1833, Britain abolished slavery in her Colonies and from 1835 to 1846 Dutch settlers moved inland, away from British control to found the new states of Transvaal and Orange Free State, governed by the Boers. Obv. & Rev. 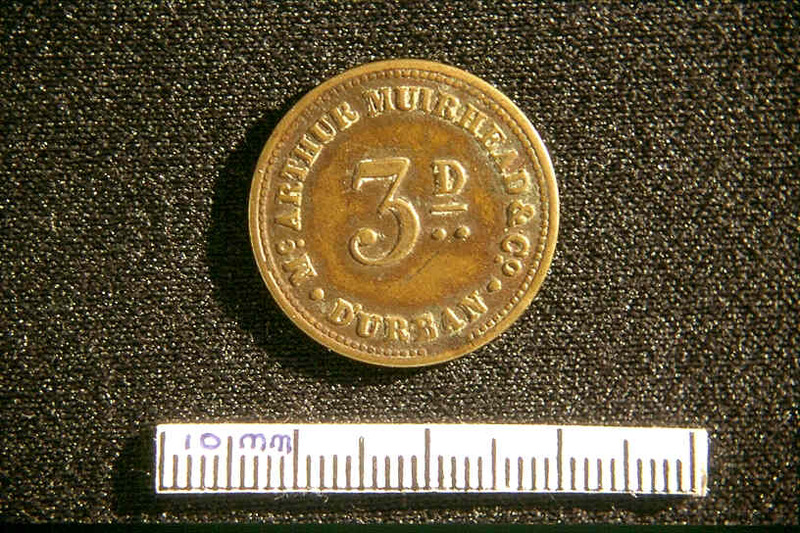 Brass 3d, McArthur, Muirhead & Co. 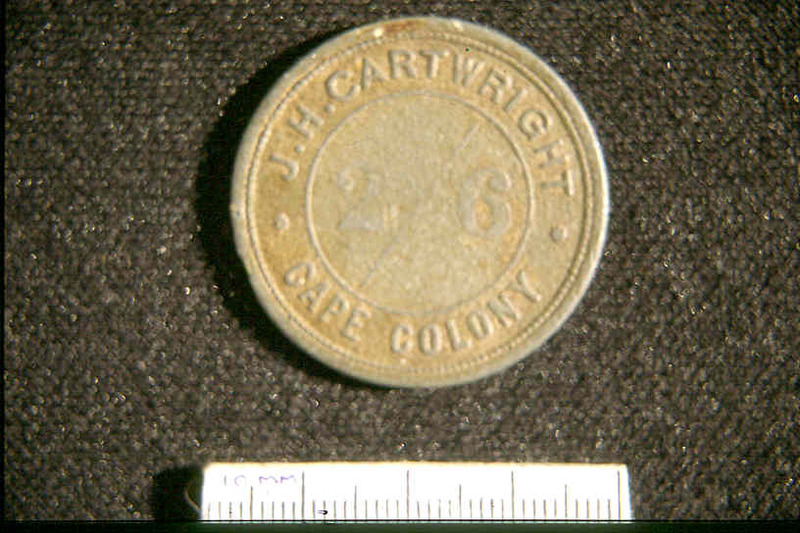 This token is undated, as are the majority of South African tokens. A contemporary advertisement tells us that it was issued in 1861 and describes the firm as "General Merchants & Shipping Agents" in D'urban. The name with its French spelling honours a Governor of Cape Province and Natal. The apostrophe was out of fashion by the late 1850's when Durban was normally used. 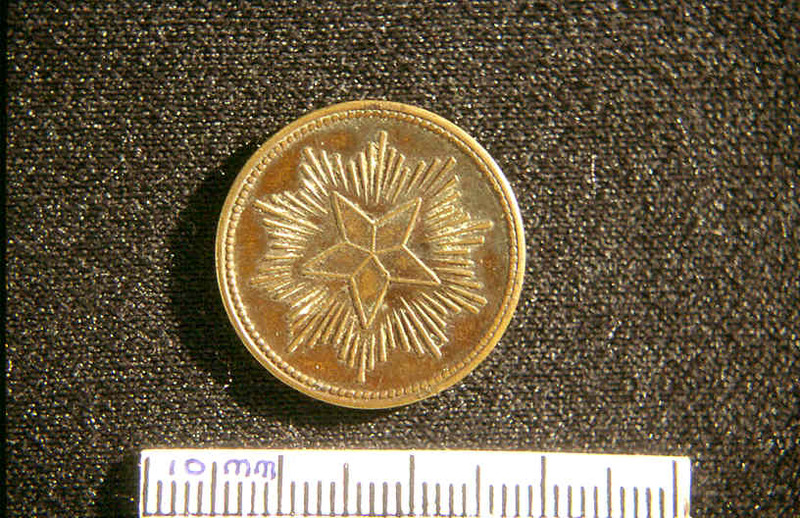 The reverse has a five-pointed Star of David, referring to the discovery of the Natal coast on Christmas Day 1487. Obv. & Rev. 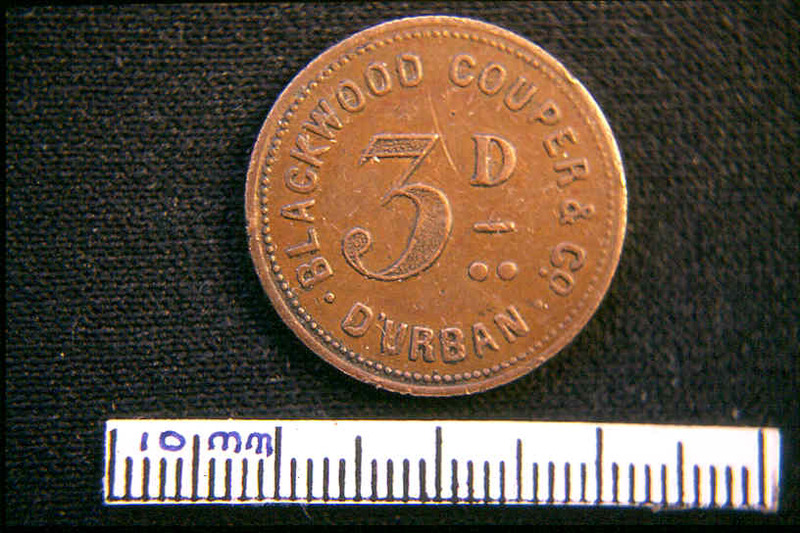 Copper 3d, Blackwood Cowper & Co. Issued by a Store and Grocery business, the reverse depicts an attractive two Storey Colonial style building. Designs other than lettering are unusual in this Series. The date 1861 may be the date of issue, but examples are known where dates refer to the foundation of the Firm, as confirmed by documents. There is often nothing on the token to indicate this. On 1st May 1864 the store burned down. Obv. & Rev. 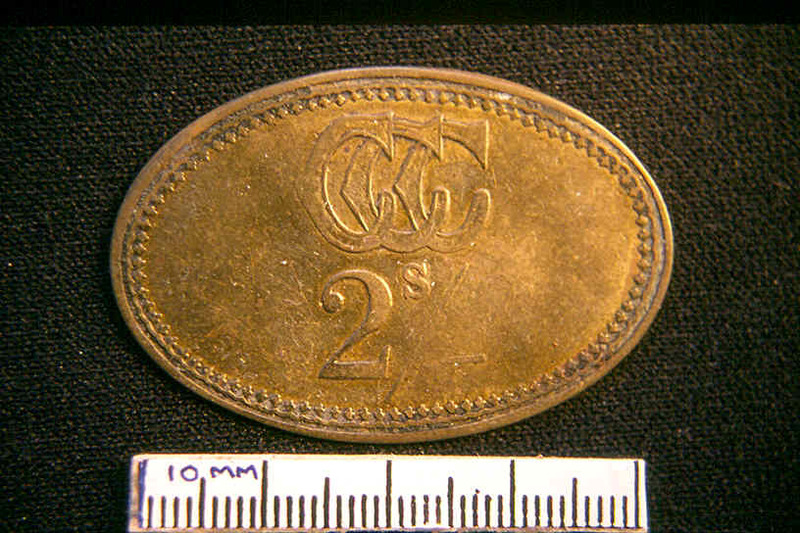 Copper "halfpenny" Whyte & Co.
Halfpenny size, produced perhaps to advertise, probably used to alleviate a shortage of change and likely to have been accepted at some time in general circulation. The reverse allegorical figure of "Hope" is appropriate for Cape Town, the capital of Cape Province. These are rare and seldom found in good condition. 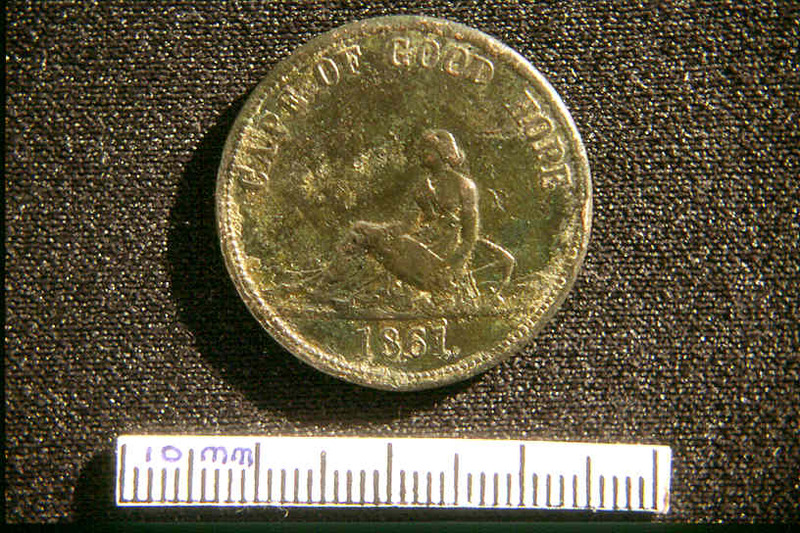 1861 is another early date and unusually the makers name is given in small letters on either side of the figure. W.J.Taylor London is a familiar manufacturer with a recognisable design style. Obv. & Rev. 2/6d Daniel & Hyman. The Partnership began on 1st January 1864 in Bloemfontein; they were Storekeepers and General Dealers. 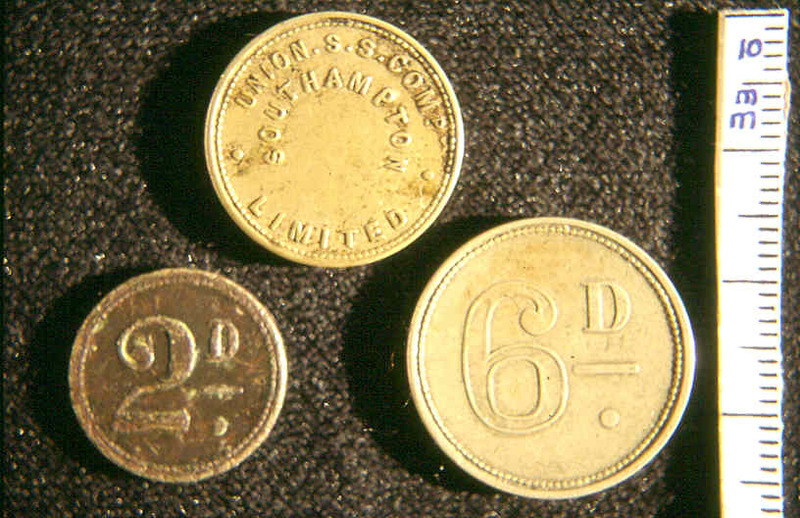 A later contemporary newspaper states that £100 worth of tokens for 2/6d, 2/-, 1/- and 6d, were ordered from Birmingham. 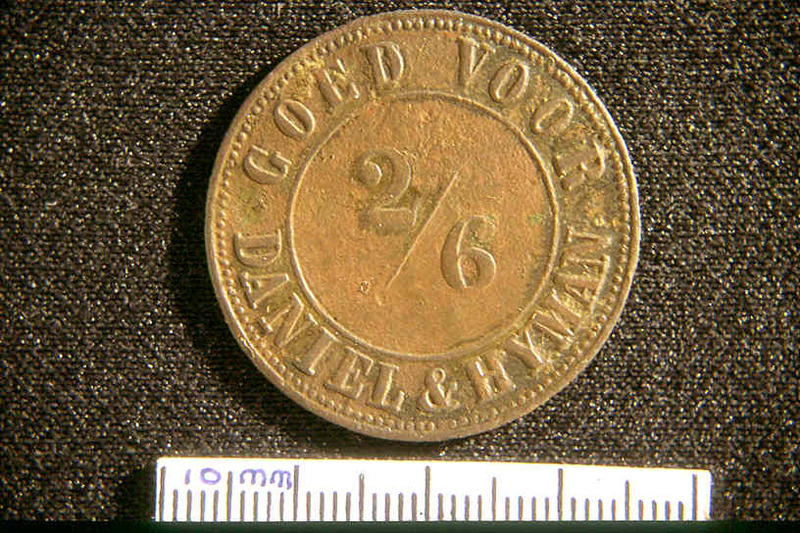 The reverse has the arms of The Orange Free State and the inscriptions are in Afrikaans 1867, coincidently, is significant, being the year when the first diamonds were discovered in the Vaal River. Unfortunately the "brassed" nickel tokens were soon counterfeited and had to be withdrawn. Uniface. Pressed brass, 2/- CCC cypher. This is the least rare of a set of values including also 1/-, 6d and 3d. The interlinked cypher stands for Cypherghat Coal Company, named after the farm where coal was found in 1860 in Cape Province. The Company was bought by De Beers probably in the1970's. 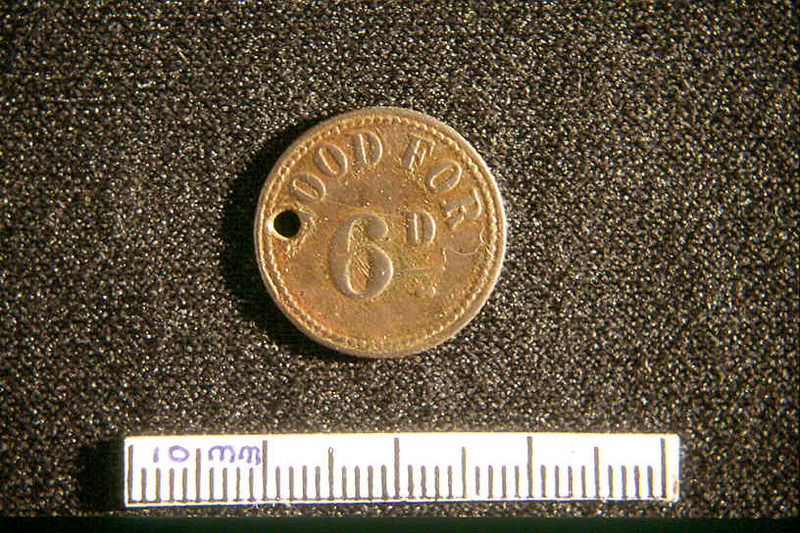 The token was issued as a "Truck Ticket" between these two dates for use in a Company shop. SObv. & Rev. 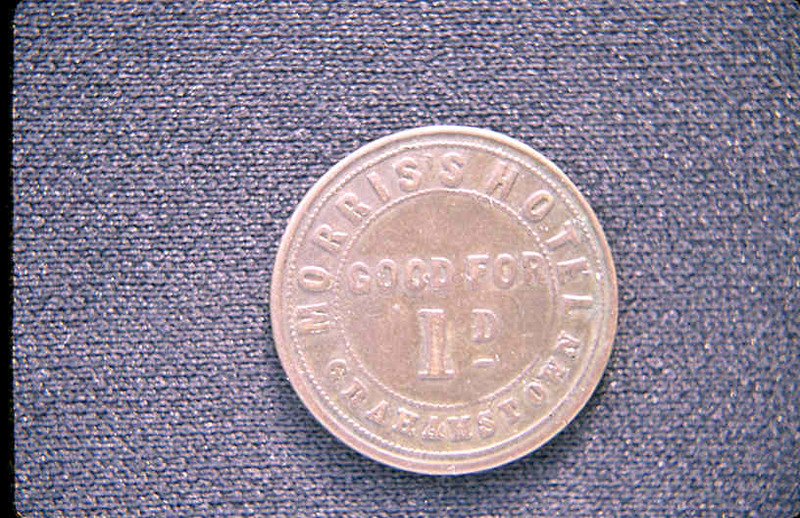 Morris's Hotel, Copper Penny. Most likely a bottle deposit token for this hotel in Grahamstown, Cape Province. 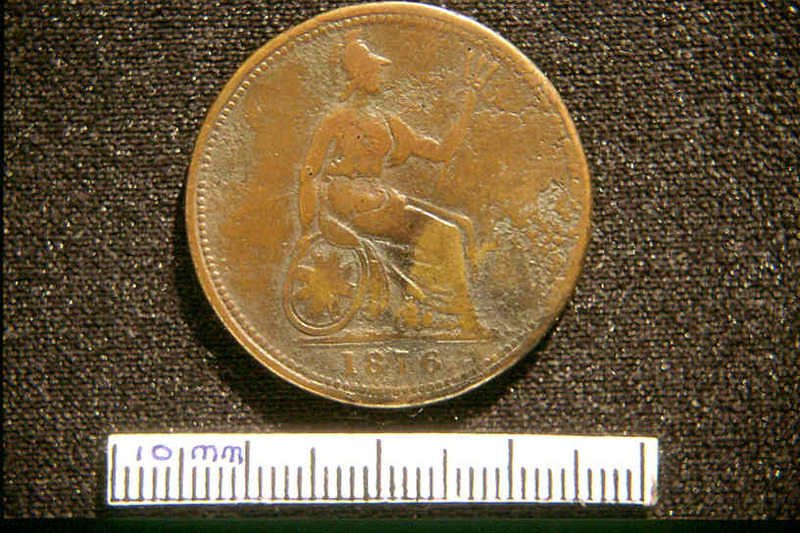 The reverse is shown with a regal halfpenny of 1873. There is no doubting that the latter was the model and despite the Penny value on the token it probably did get into general change. Obv. & Rev. Brass sixpence "The Hotel", Kimberley. An advertisement by F.C.Soloman in April 1872 referred to "The Hotel" as supplying comfort and privacy such as was not available in "Fields", the cost was 12/6d per day. It never had any other name and its location was "lost" until the 20th Century. Other values issued were 2/6d and 1/-, perhaps as receipts for payment in advance by its customers heading for or returning from the Kimberley Diamond Mines (" Fields"), discovered in 1871. 3d Obv.above 2d and 6d below, Union Steamship Co. There is also a shilling value; the 2d is brass the others cupronickel. The Union Steamship Company was formed in 1853 and it provided a service from Southampton to Cape Town via The Ascension Islands and St. Helena. From 1857 they had Mail contracts with a steaming time of 42 days. 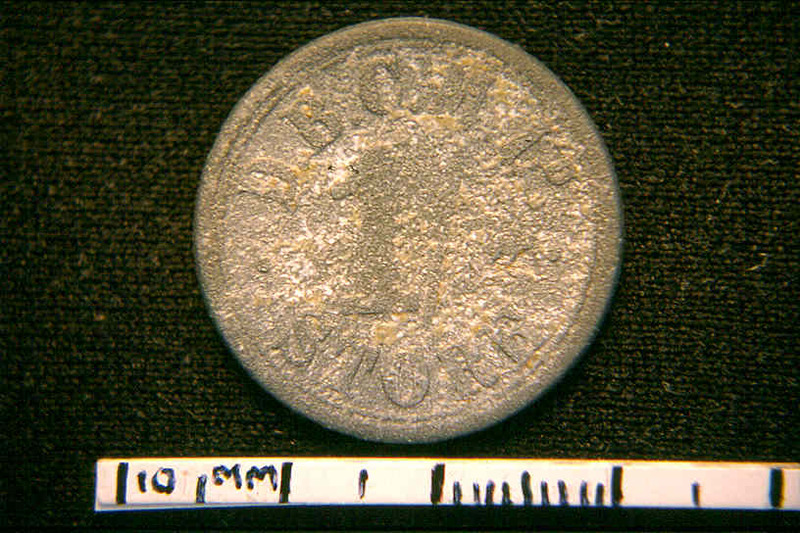 Some collectors assumed the tokens were used in Southampton, but there is no evidence for this. South African collectors claim them for paying casual Labour during the second half of the 19th Century. They were probably made in England. Obv. Marsh and Sons, Halfpenny. Their name appears in Directories from 1846 to 1921 listed as General Importers and Ironmongers. The reverse has a paddle steamer under sail and steam and the die was also used by H. J. Marsh and Brother in Tasmania. The brother died in1854 and the Tasmanian issue can be dated to a year or so earlier like other undated issues for the Island. The unknown maker is probably English. Despite a strong assumption that branches of the same family are involved, no family history has been found, the only connection is the reverse die. 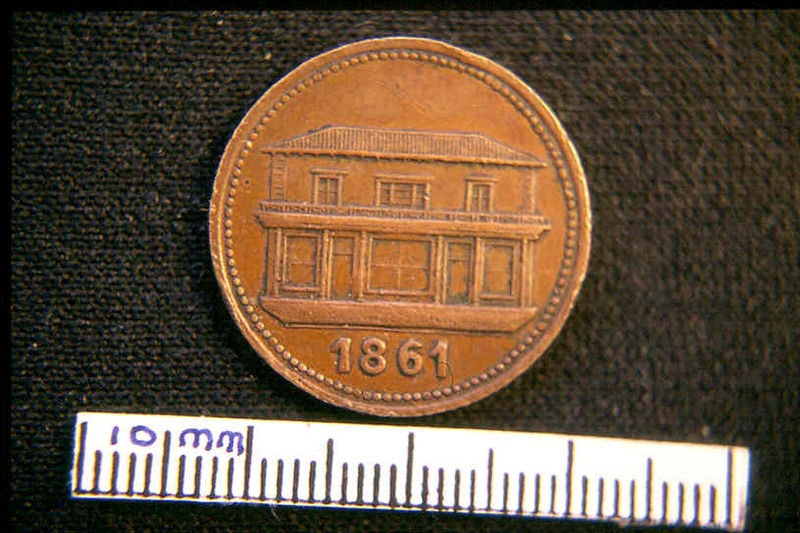 The Cape Town copper halfpennies are thought to have been issued in the 1870's. Obv. & Rev. M. Franklin, Brass Penny. Franklin was listed in the 1865 Natal Almanac as a working Tinsmith and General Store keeper. The obverse letters P.M.B.U.R.G represent the engraver's shortening of Pietermaritzburg with some misplaced stops! The reverse uses Britannia, but no value is shown. 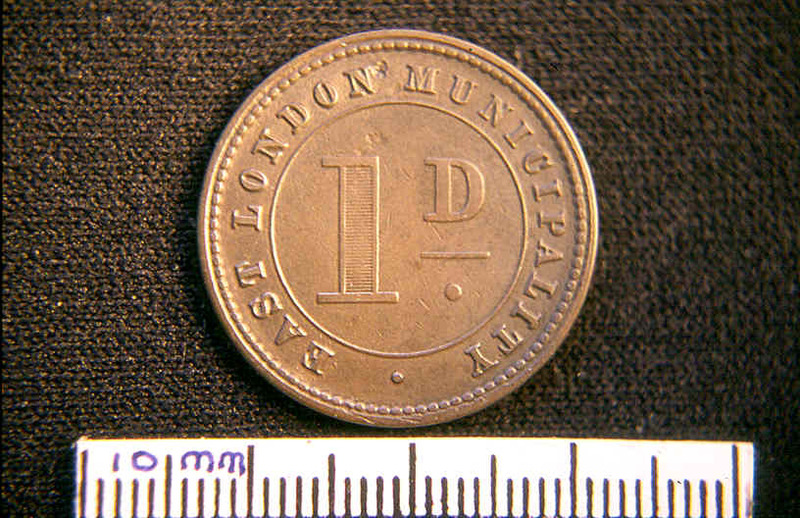 This is Penny size (33mm), a similar piece of 27mm was also produced and would have equated to a halfpenny. Reverses could be confused with British regal bronze and about half the coins are countermarked with "A CARD" to the left and "NO VALUE" to the right of Britannia. A document records that this was done personally by Franklin. Obv. & Rev. J. W. Irwin, Copper Halfpenny. Rev. Newfoundland Rutherford Bros. Halfpenny. 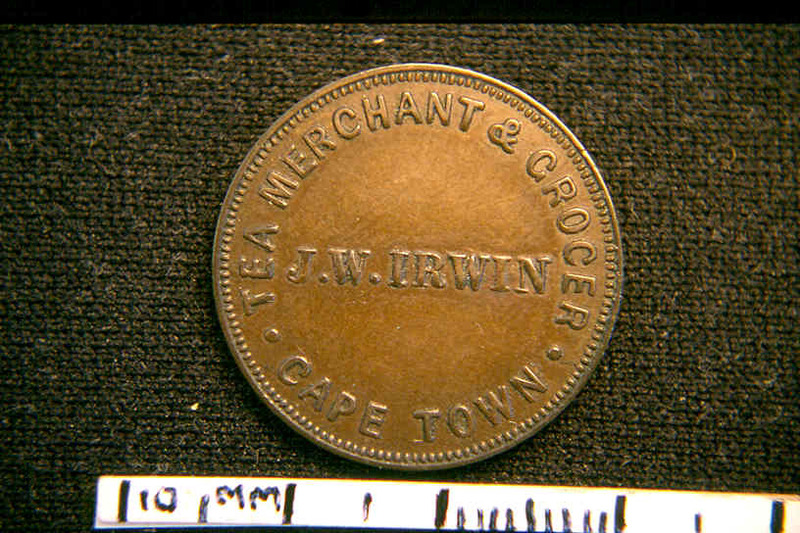 A notice in the Cape Town "Lantern" 26th April 1879 reported that Irwin the Tea Merchant and Grocer had imported a quantity of Halfpennies "to aid the giving of change". There is no value stated however, but its reverse carries the Arms of the Cape of Good Hope. 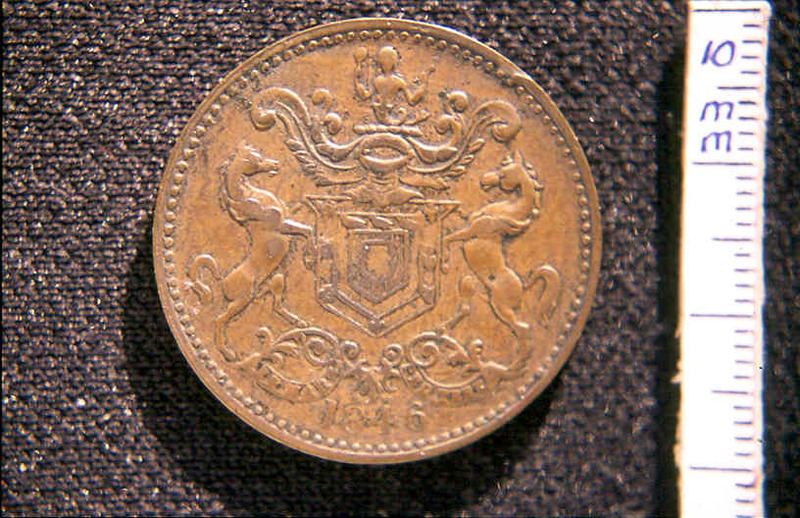 This design reminds collectors of British Colonial copper halfpennies of Newfoundland and the reverse of one of these is shown with Arms and Supporters. Engraved by Ralph Heaton II, the R H is in small letters over the centre of the 1846 date. He died in 1862, but the engraver of the Irwin piece, whoever he was, may have used Heaton's work as a model. Obv. & Rev. East London Penny. This 1880 Cape Province issue was a year after the traumatic shock of the setbacks and recovery of the Zulu war with the British. 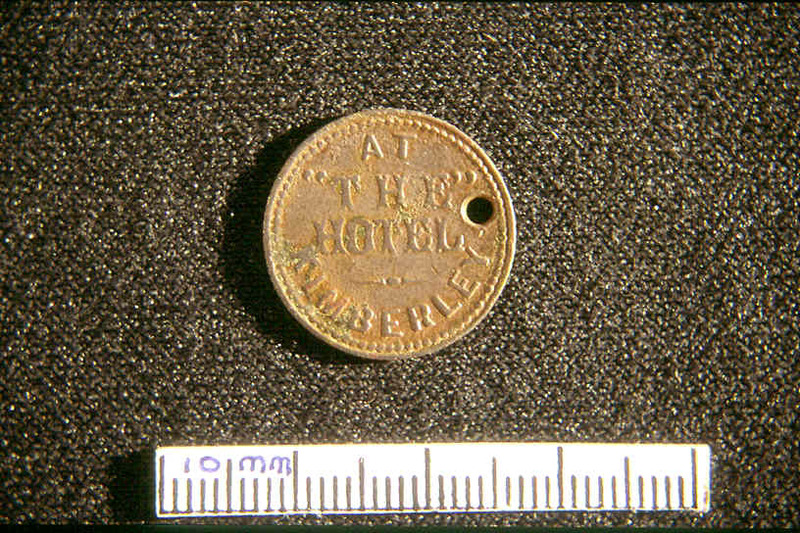 As so often, manufacturer of this neat token is not known. The promise of Municipal repayment would have helped acceptance by local traders, despite it being about the size of a regal halfpenny. Surprisingly documentation tells us that it was issued for use as a ferry token for crossing the Buffalo River which divided suburbs from the main town. Presumably a late decision as there is no mention of this on the token. Obv. & Rev. 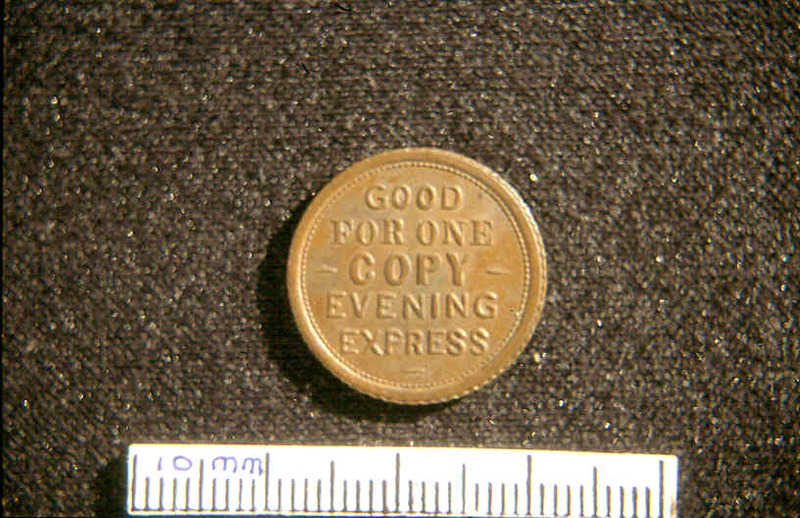 "Evening Express Halfpenny". 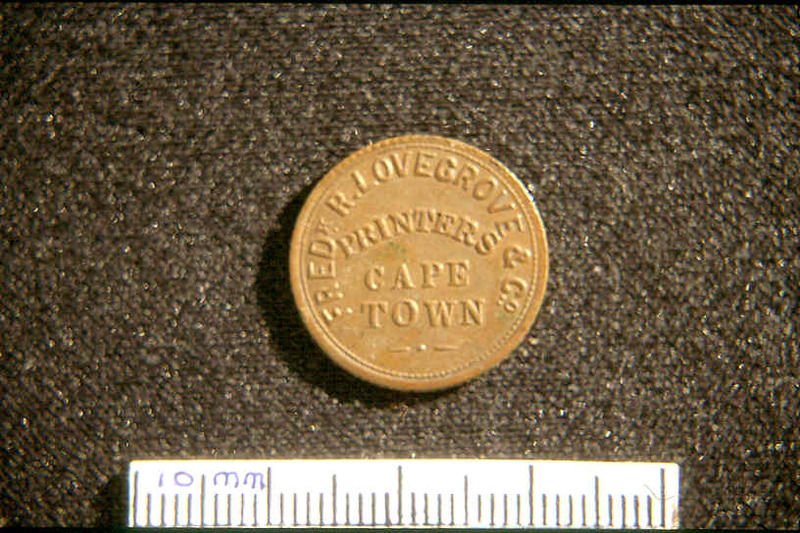 Has the form of an advertising token for the Newspaper owned by Frederick Lovegrove who established it about 1880. It had a weekly circulation of 18,000 copies delivered around 4.00 pm. Monday to Saturday: those for outlying areas of Cape Town were distributed using trams and trains. The 1st July 1882 edition announced that, to ensure delivery, a small charge would be made in future. There would be increased news and Cablegram coverage. 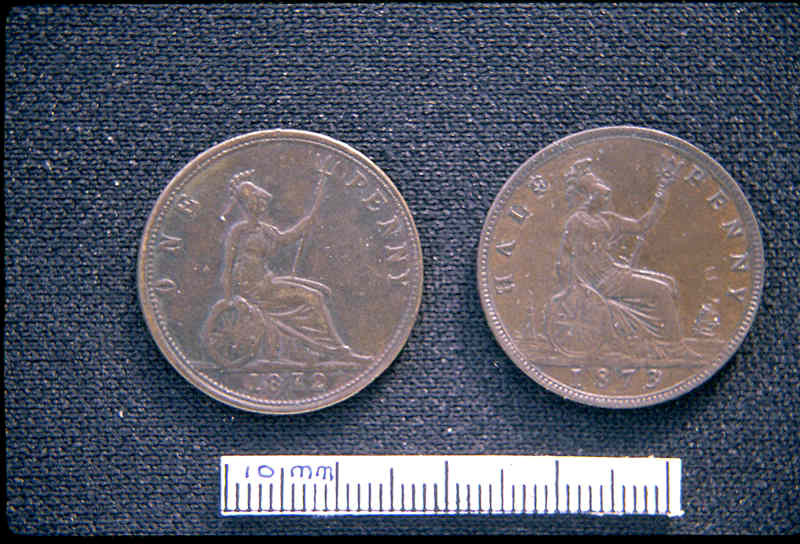 "To avoid inconvenience of small change, the Proprietors have at great expense, imported from England a copper token of one halfpenny...." 10,000 were struck in Birmingham and any quantity could be purchased at three pence for six tokens. 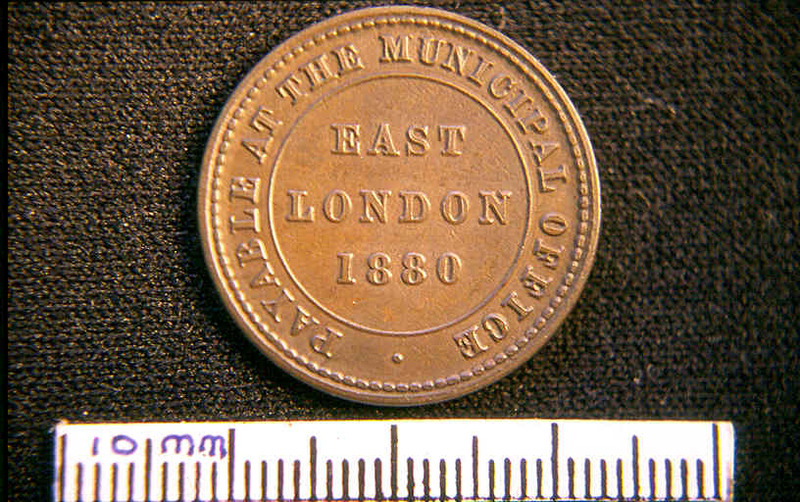 There is no evidence that this farthing-size token was used in general circulation. Uniface. 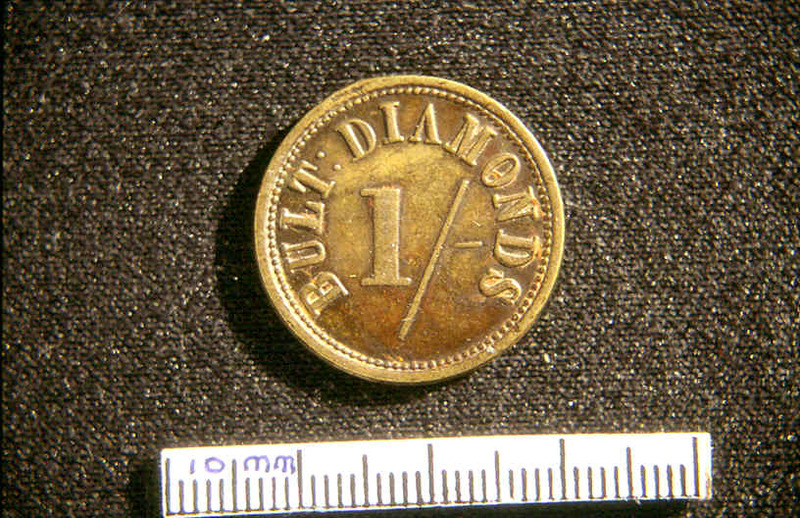 Bult Diamonds Brass Shilling. Sixpence and two Shillings values were also struck. The find at Bultfontein, 95 miles NE of Kimberley, was made a few years after the 1867 find in the Vaal River placer deposits. 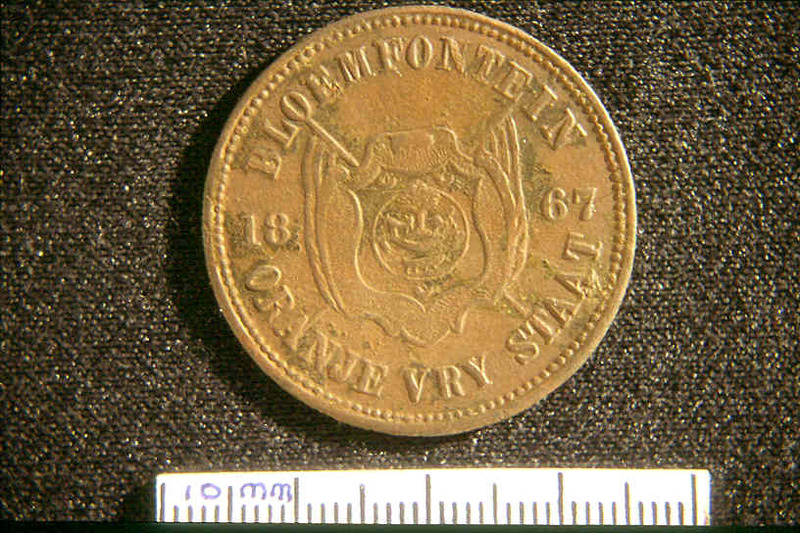 In 1888 this Mine joined the De Beers Group, who had their own series of tokens. The brass "Bult" tokens would have been in use from the 1870's to 1888 at the latest. Uniface. De Beers Zinc Shilling. The letters D. B. C. M. Ltd. stand for De Beers Consolidated Mines Limited. Store under the value indicates its use in a Mine Compound shop. Numerous Mines formed the Group each having different tokens by various piercings or countermarks on standard pieces. 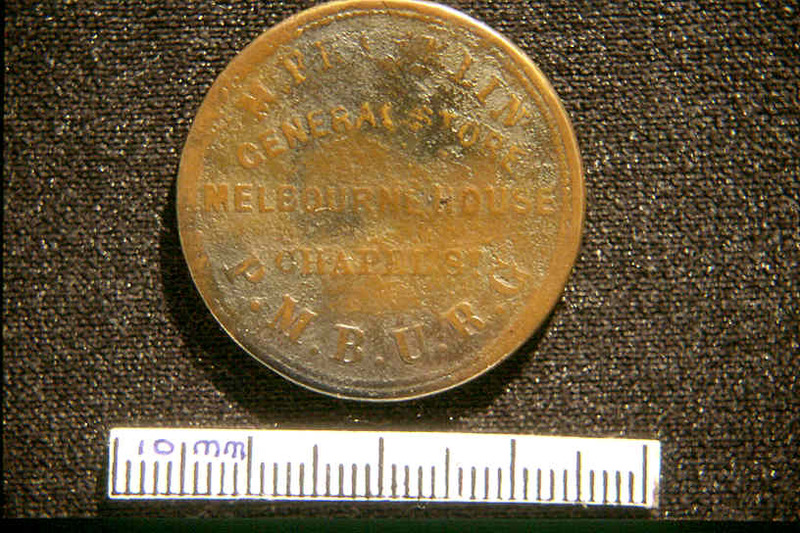 This badly corroded specimen in unsuitable zinc has a small "Lion" stamped under the bar of the shilling sign, which was for use in the Wesselton Mine. By 1889 the Group controlled 90% of the World's diamonds. Uniface. ¼ Dag and 1 Dag in Brass. "M" is for Montagu a town 100 miles East of Cape Town. 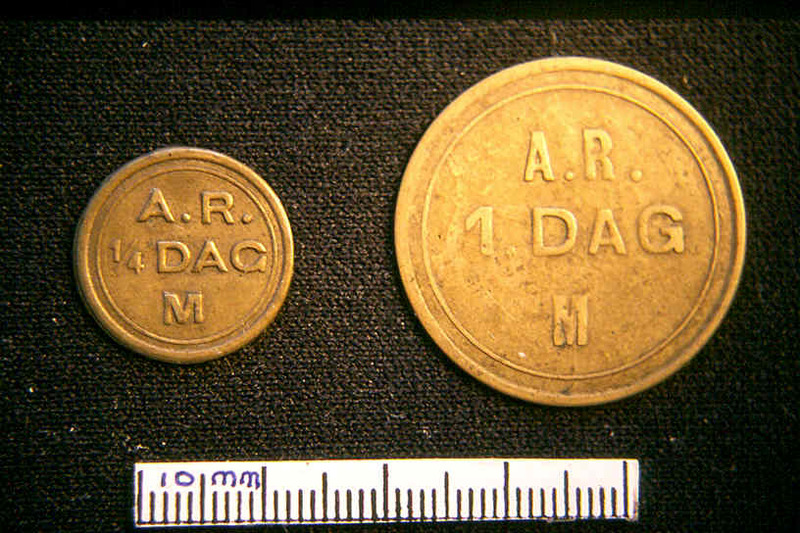 It issued these tokens including a ½ Dag or day, for paying casual labour working for the "A R" which stands for Afdelings Raad; Afrikaans for "Divisional Council". Issue date and manufacturer are not known though their style looks 19th Century. Map of Modern Southern Africa. The towns issuing tokens, including those mentioned in the talk, are shown underlined in red. Those marked in yellow are mentioned when discussing two tokens issued by railway construction Contractors. Railways were developed speedily in the last quarter of the Century, including the line North to Rhodesia a part of Cecil Rhodes influence. He was Prime Minister of Cape Province from1890 to 1896. Uniface. Zinc 2/6d. J. H. Cartwright. This British sailor, born in 1855, became a Railway Contractor working on lines in the South from 1883 to 1897; also on the one running North through Kimberley, Vryberg, and Mafeking to Bulawayo. He was widely known for well run construction camps. This token series also included values of 20/-, 10/-, 1/-, and 6d. 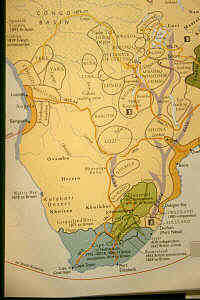 Map, Close-up of Southern Africa. The railway lines in the South can be seen better at this scale. 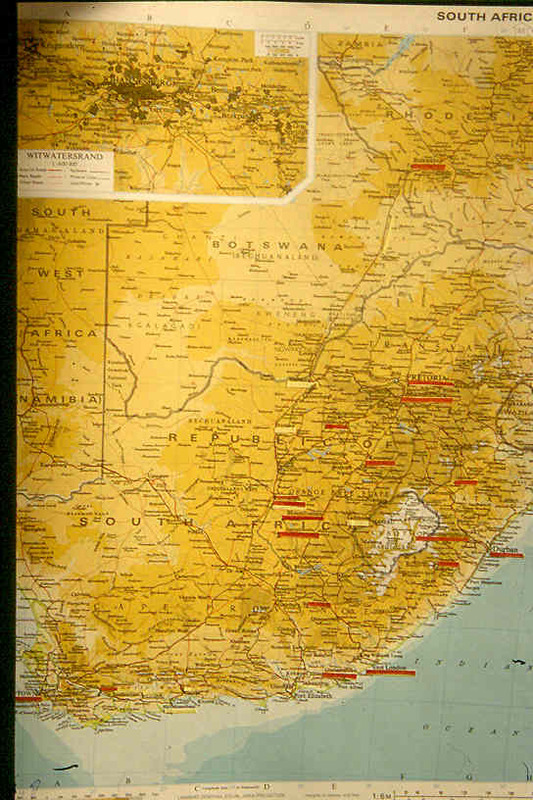 The area around Bloemfontein is where T. P. Staples worked. Construction, interrupted at times, but not halted everywhere, continued after the outbreak of the Boer War in October 1889. Obv/Rev: Brass 2/-, T. P. Staples. 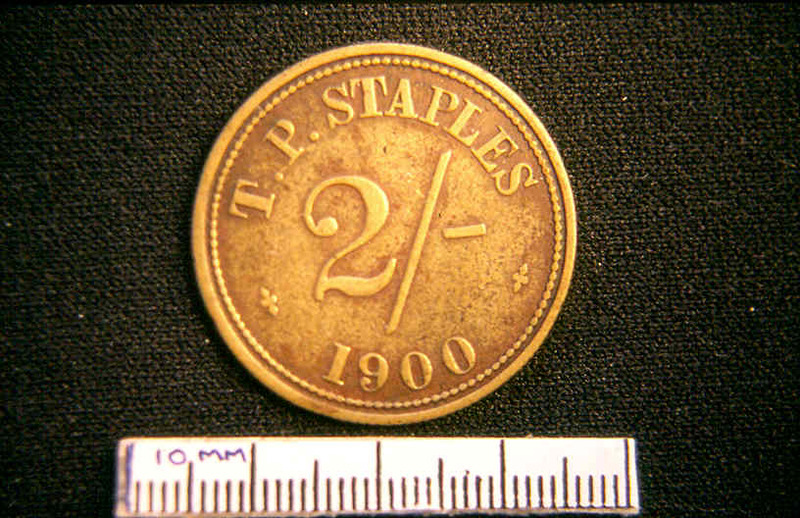 Staples had two series; uniface dated 1895 and 1900 using the same design for both sides. The second series also has values of 1/- and 6d. both are now rare. 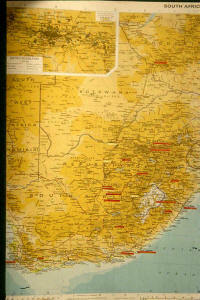 He constructed the line between Modderspoort and Ladybrand, 80 miles East of Bloemfontein, where his firm was based. He must have worked on other lines, but these details are lost. 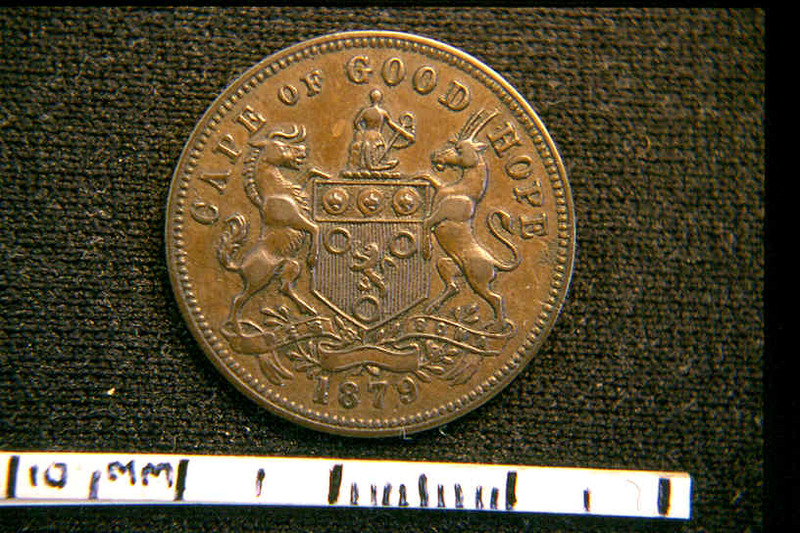 Token issues continued into the 20th Century, but in 1928 metal tokens became illegal. 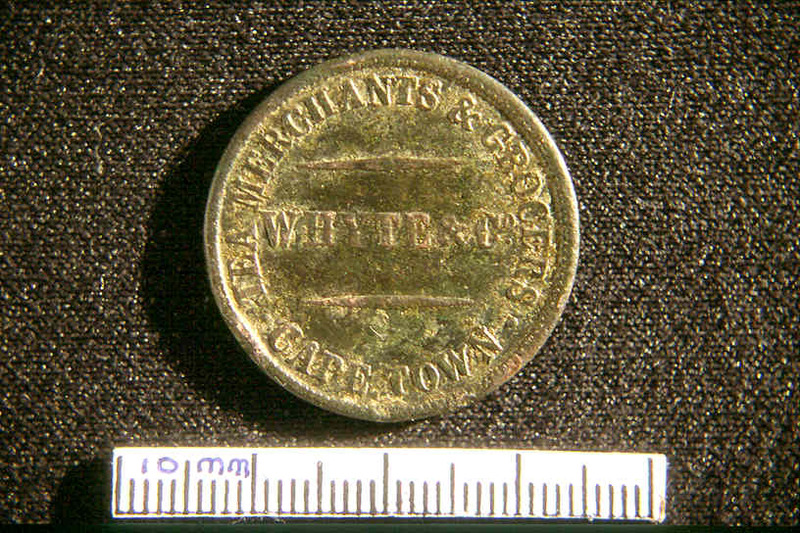 Regal coins, minted in South Africa began in 1923 and perhaps surprisingly the well known Kruger coins were still being accepted into the 1930's.